Land of the Lost, Season Three, continues its transition -- some might call it descent -- from science fiction to out-and-out fantasy in this outing, “Abominable Snowman.” Here, a yeti-like creature comes down from the mountains in pursuit of its prey, a unicorn that Holly (Kathy Coleman) adopts as a pet and names Corny. 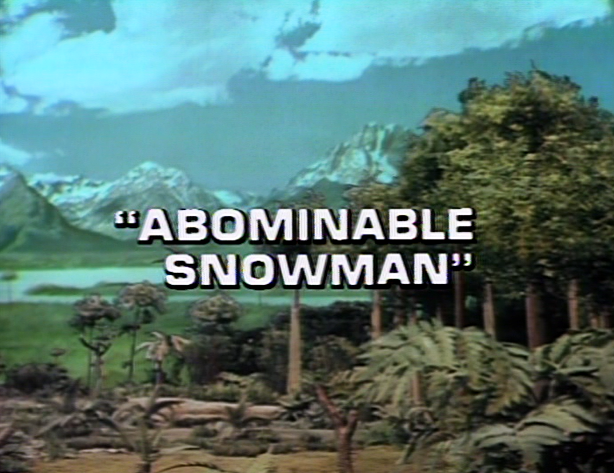 When the Abominable Snowman takes Corny back to its snow den, Holly and Chaka pursue, hoping to rescue the innocent animal from the carnivorous yeti. They meet the yeti face-to-face in its cave and are able to escape in time for a quick rendezvous with Jack (Ron Harper) and Will (Wesley Eure). 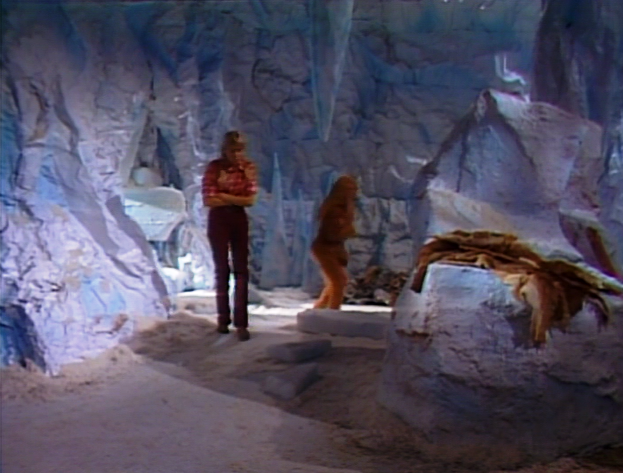 All throughout The Land of the Lost’s television run, the snow-capped mountains in the distance of Altrusia, on the horizon, have been visible, so I don’t have a problem believing that a creature like the Yeti (or Thapa, as Enik calls it) inhabits them. Although it is strange that he hasn’t come down from the mountains until now, I can nonetheless accept him as a new denizen. My only wish would be for a better or more convincing, more frightening costume. 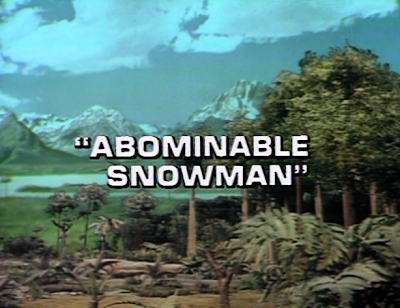 Also, the Abominable Snowman as seen here seems gentle, dimwitted and not very fast-moving, so the Sleestak’s fear of it doesn’t make a whole lot of sense. 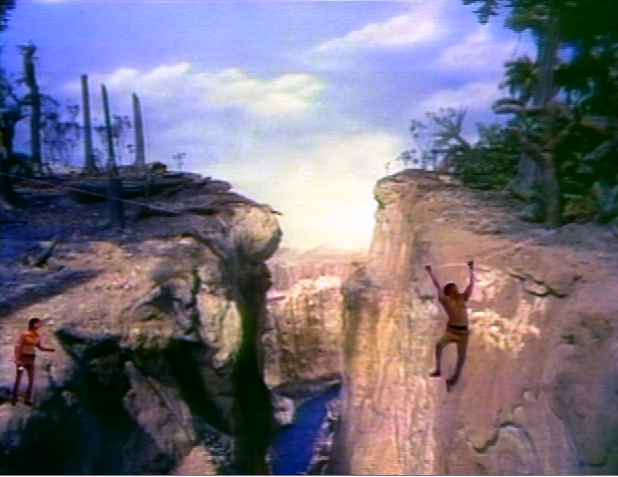 There seems to be a pattern in these Season Three shows that goes like this: The Sleestak send a messenger -- always Enik (Walker Edmiston) -- to the Marshalls to demand that the humans solve some problem in Altrusia. Enik complies, and so do the Marshalls, and then the threat is mitigated. 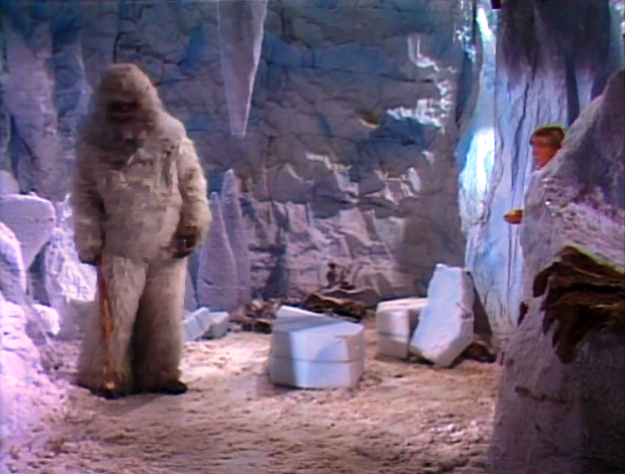 This is how things have gone with Malak (“Survival Kit”), Torchy (“Cornered”) and now the Abominable Snowman. Between the bad costume for the yeti and a blooper moment in which a boom mike dips perilously into camera frame, “Abominable Snowman” isn’t the most visually-accomplished or exciting Land of the Lost episode. That fact established, I am glad to see that Holly is again showing her independence and courage. Too often recently she has been shown simply sweeping up the temple, essentially sidelined as a “house wife” while Jack and Will do the adventuring. But here Holy takes a big risk to save her pet, and again reveals composure and grace in the presence of a monster. The bad costume looked like it was borrowed from Sid & Marty Krofft's Far Out Space Nuts. 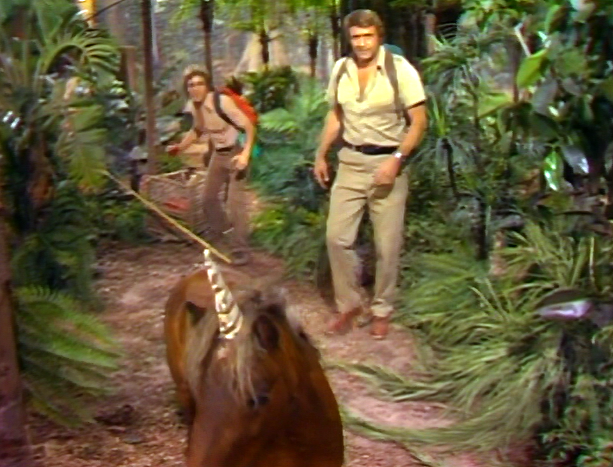 However, as a boy in the '70s, I never really cared about these obvious flaws in any series because it was always about the story first.